Specifically Engineered for Ford SD ‘85-11, and Dodge HD ’94-10 trucks fitted with or without aftermarket airbags and with factory contact overloads. Torklift’s large Stable Load Spring Pads replace the smaller, inefficent factory rubber bump stop pads, putting the factory springs back to work stabilizing the suspension and the truck’s load. 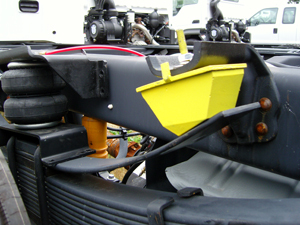 Actual product color is black; shown in yellow for contrast.